This game goes right along with the Santa On/Off game I posted yesterday. It's another fun way to learn number combinations, but more challenging. A container (can, cup, bucket) of some kind. I used a bucket from the dollar bins at Target. I have a million of them! I have the hardest time passing up cute containers. 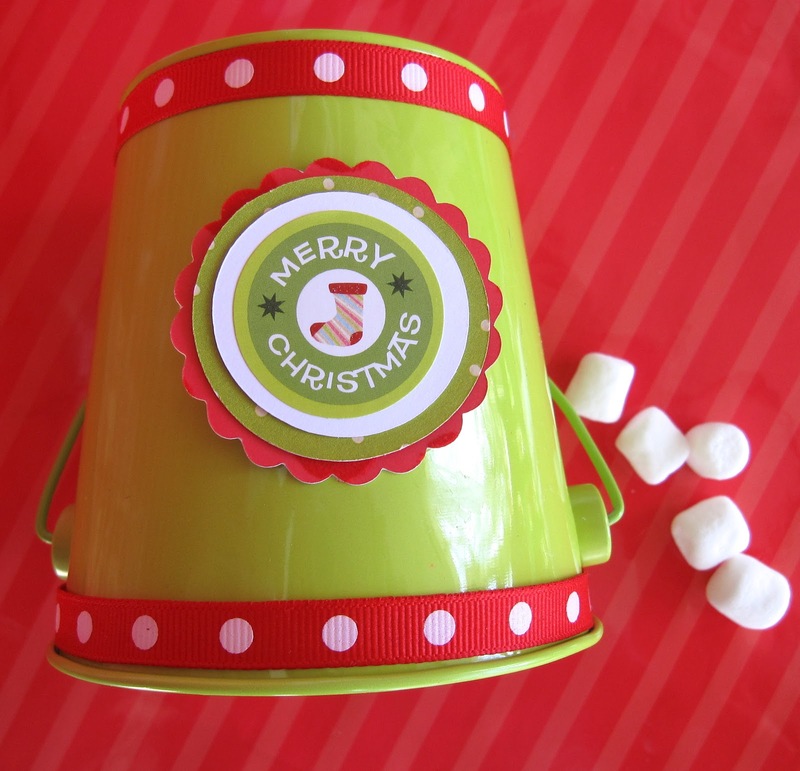 I decorated mine with some ribbon and a Christmas sticker mounted on card stock. A plain old cup would get the job done as well, just make sure it's not clear. Counters of some kind. This time I'm using marshmallows. Your counters can be anything small enough to hide in the container you've chosen. 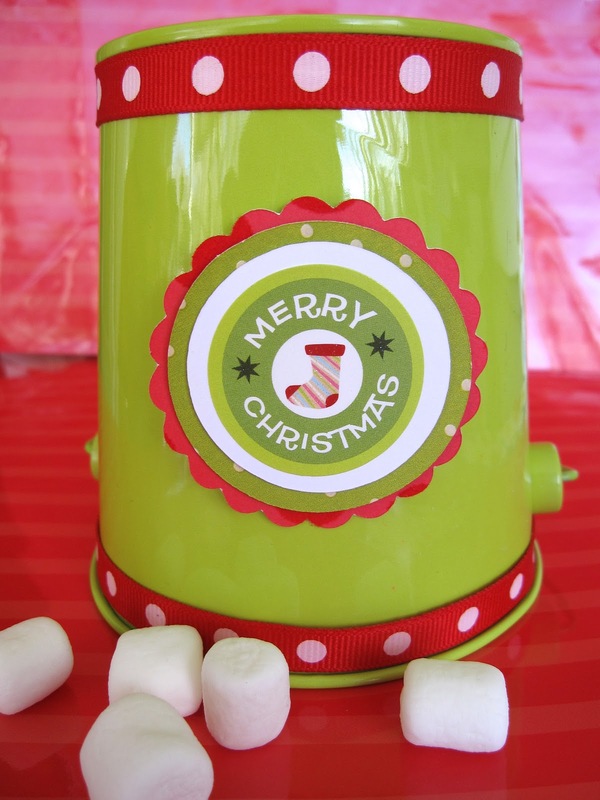 Once again I have a cute container for the marshmallows (totally unnecessary, but adorable!). 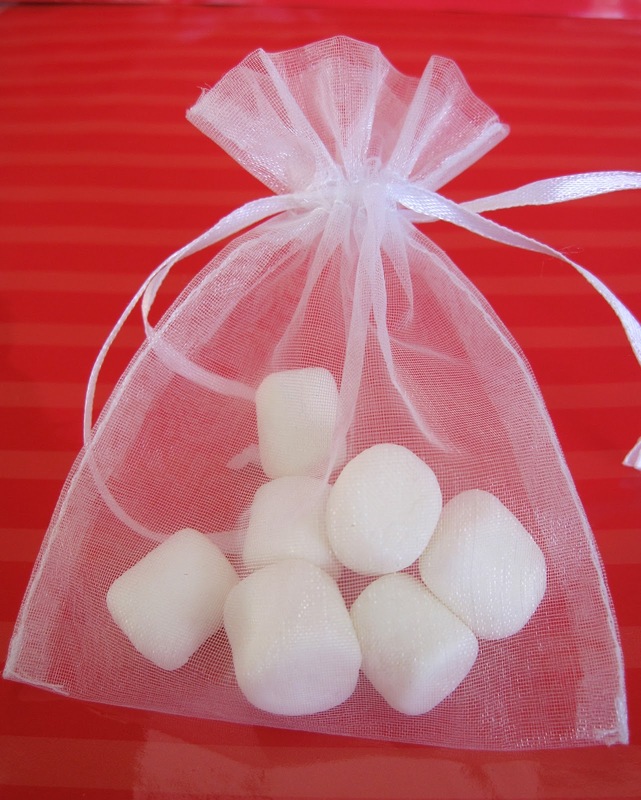 These fantastic little white bags can be found at Dollar Tree. I think you get six for a dollar! I usually find them in the wedding isle. Next, you'll need some kind of record sheet. I've made several here you can print out, or a plain piece of paper would work. Recording helps your child see all of the combinations for the number of counters you are using. The numbers at the top of the record sheets are the number of counters you'll need. I included a blank record sheet so you choose the number of counters. Oh, and you'll need two players for this game. Choose the number of counters you want to use (smaller numbers for younger kids, bigger numbers for older kids). Have one child close his/her eyes (or go out of the room if they tend to be peekers like my boys) while the other child hides some (or all) of the counters in the container. When the counters are hidden the child uncovers his/her eyes and tries to figure out how many counters are under the container based on how many counters are left outside the container. I used six marshmallows in the picture above. Five marshmallows are outside the container, so how many would be inside? Tricky, I know. Kids get the biggest kick out of this. Who doesn't love a good guessing game? At first it might be a guessing game, but it doesn't take long until they start using some math skills to figure it out. You could even have your child write out the number sentences (5+1=6, 3+3=6, 0+6=6,...) after the In/Out record sheet is filled in. Happy counting! This is a cute idea! I love it. We may just have to give this a try. 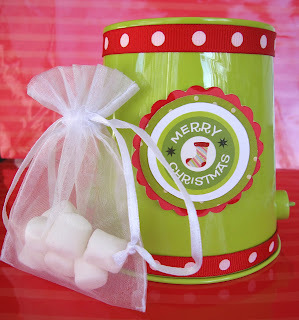 Thanks for sharing at Pin It Wednesday @Pounds4Pennies.